Breathtaking scenery surrounding an intimate mountain retreat style village, a world class mountain with over 4000 vertical feet (1200 meter) of exiting skiing and paragliding! From double black diamond glade skiing to un-crowded wide open groomed cruising to exclusively novice only trails, Panorama truly is for everyone. NOTE: Please do whatever you can to enhance the image of our sport and to ensure we continue to be welcome visitors at this great site. Also do not just get a paragliding ski ticket and not bringing your wing. Meaning that the ticket is only valid if there is a chance to fly. Available only on flyable days. Over 4000′ vertical feet to the Landing Site. Panorama Mt. 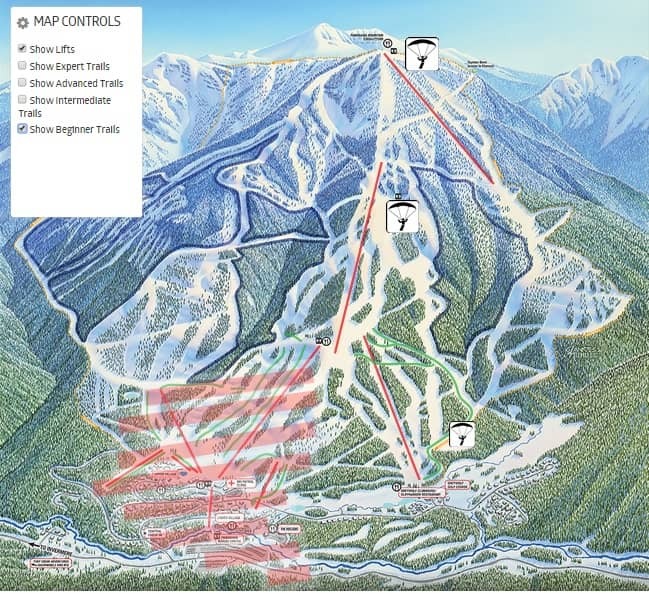 Resort is located only 2 hours southwest of Banff or 30 minutes west from Invermere. We have 2 Launch sites. First choice and most used launch site is 2/3 up the mountain above the Elkhorn Cabin or just below the outhouses (870m vertical). This is an easy and shallow launch site and accommodates up to 5 gliders facing NW. Summit Launch “Roy’s Run” (1200m vertical) is a steep, wide open launch (up to 5 gliders) facing W to SW. 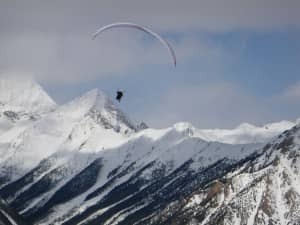 This launch is only for good skiers and this can be a tricky launch site to set up your wing as the slope is steep and the wing might slide down while you get into your harness. Do not set up you wing on top of Roy’s run were people ski down the “easy way road” as this will be conflicting with the ski traffic. The launch from the 2/3 up section is what we recommend to fly off most of the time. This launch is shallow and on skis you will not have the same initial power to inflate your glider like by foot. We recommend to ski into the loose lines and hold your front risers above your shoulders to inflate the wing. The acceleration is also very slow compared by foot launches, so keep your chest forward (after your glider is already well above you) and give it some time to create the necessary takeoff speed. Do not try to take off by pulling your break lines right away as the canopy will stall with the little speed you have. The launch areas are only accessible with skis/snowboard and therefore we launch with skis/snowboards. Respect and watch for skiers/snowboarders before you launch. We launch in their terrain. (see the lowest icon on the map below). If the wind should be coming to strong from the west (you should not be flying anyways) land on the golf course below. Here are a few suggestions which may be of use to those unfamiliar with flying a Paraglider at Panorama. 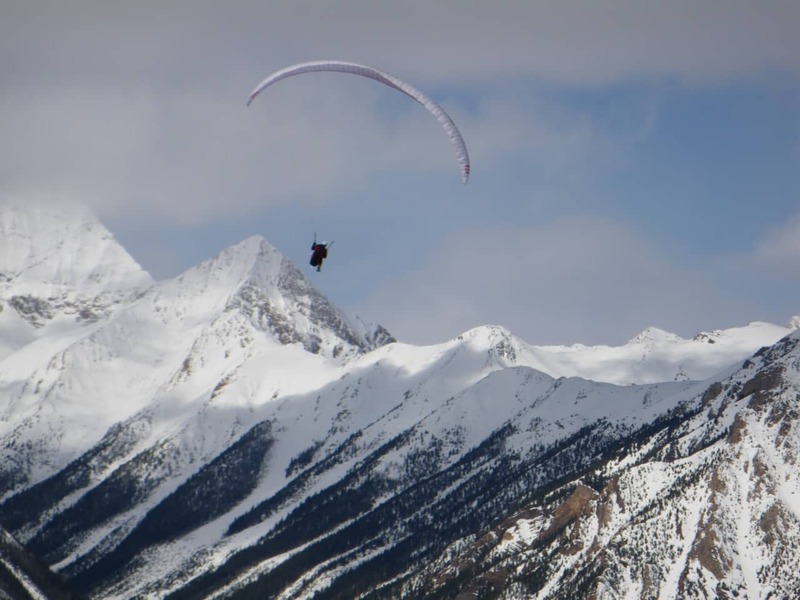 They are based on the experience of Paraglider pilots who have been flying the area. There is no guarantee that you will be safe even if you follow all these guidelines. Do not take off if the average wind speed is over 20 km/hour; winds aloft may be even higher. When deciding whether to fly or not, bear in mind the performance differences of various gliders and differences in the level of risk various pilots are willing to assume. Also be aware that wind speeds in the valley may be higher than, or lower than, or in a different direction from those at peak-top level. Do not drift behind any of the peaks in a thermal unless you are at least 150 meters above them and your angle with respect to the peak is less than 30-45 degrees. If you leave the thermal into head wind and sink, you may be unable to glide out to the valley. It may take a day or two to walk out from the wrong side of the range.